The ad, ‘An Ode to the Sugar Lovers’, was devised by the agency’s team of Executive Creative Director Jonathan Deeb, Creative Director Gareth Paul, Copywriter Jessica Everson and Art Director Kyra Antrobus. To showcase the 123-year old brand’s repertoire, it’s a fast-paced stream of photographs of a sweet treat and the person who makes it from the ‘tuisnywerheid’ entrepreneur to the young wife cooking to impress her mother-in-law, to the church fête supporter to the boyfriend and girlfriend enjoying umbubhudlo1, to the sweet tea drinker and the elaborate dessert creator. Not only does this execution demonstrate the versatility of the product, it drives home the point that, no matter who you are – the brand’s target markets spans LSM 4-10 categories – or what you make, Huletts adds that extra sweetness to make it extra special. Huletts had not advertised on television for over a decade, and put its business out to pitch on a TV brief. The agency’s response was the promise that ‘A little Huletts sweetness goes a long way’, and carried this through to various point-of-sale and out-of-home executions. 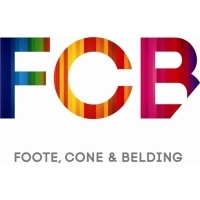 “We were obviously delighted when our strategy and execution won us the business,” said FCB Joburg Executive Business Director, Mike Di Terlizzi. “And even more pleased when the pitch work was taken through to the small screen. It’s not often that this happens.